Предлагаю уроки английского по Скайпу. ВУЗ: горловский ИНЯЗ, учитель английского/психолог (диплом откроется в новой вкладке). Бонусы: кембриджский сертификат знания английского CAE (сертификат — открыть в новой вкладке). Длительность урока: от 30 мин. до 3 часов (исходя из целей и доступного времени). Стоимость часа: 500 рублей (WebMoney, Western Union). Ниже — я на видео + моя биография in English. My name is Sergey Larin. I can help you with learning British English. I graduated from Gorlovka Teacher Training Institute in 2009 having studied for an advanced 5 year degree in teaching English with psychology. I started teaching before taking my degree, so in total I have taught English for 8 years. After my graduation I tutored adults in Donetsk which resulted in one of my students being able to move to California. At the beginning I would give lessons at my flat using Russian textbooks then I progressed to teaching through distance learning on the Internet, which I have been doing for just over two years. I have experimented with various different teaching styles and found that students learn better through using British Oxford books. At our lessons we discuss a variety of topics, which can be anything from food to travelling. Most of my students aim at becoming fluent in speaking, but I also like explaining grammar and pronunciation. I try to encourage people with a variety of activities, like reading newspaper articles, watching and listening to videos and audio recordings, writing essays, and role playing dialogues. I try to be consistent by providing rules as a basis and then propose a large amount of practice, because practice makes perfect. It is in my nature to study and to polish my skills. I’ve been having lessons with a British teacher for two years and it is my aim to pass the CPE exam which would prove conclusively that I’m a fluent speaker, and close to a native one. I have five friends in Britain; three of them in Birmingham, one in Coventry, and one in London. They often help me with my linguistic problems and I sometimes ask them questions which my students send to me. With my twenty years of studying English and 8 years of working as a private tutor I hope I`ll be of help to you! I am able to teach all levels, from beginners right through to advanced; I have also recently started giving lessons in Business English — for Intermediate learners — and I don’t teach more than fifteen students at any one time. This enables me to give a high level of support to my students which allows them to learn faster. 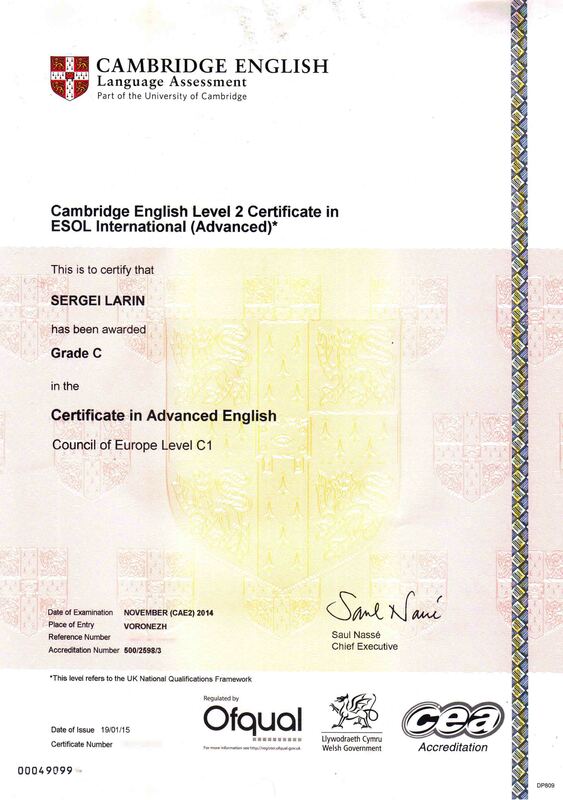 Sergey speaks and knows a very high level of English and is a good teacher, спасибо! Для того, чтобы позвонить мне — активизируйте QR код на странице. Высокий уровень английского. Отличный подход к преподаванию. Спасибо! Если захотите репетиторствовать в России, напишите мне. Могу помочь.